If you’re hesitant about starting a garden, always remember that the USA is founded on agriculture. Many states produce crops not only for the entire country, but also for import all over the world. Chances are, there’s always something to grow anywhere on the US map, even in places you won’t think are plant-friendly. Serious gardeners rely a lot on climate zone maps and hardiness zone charts for reference. These may be tedious to interpret at first, especially among those who aren’t well-versed in temperature degrees. But when broken down into other factors like frost, climate, and soil fertility, they can prove to be quite handy. Below is a map from the US Department of Agriculture indicating the hardiness of vegetables, herbs, and flowers to cold. In many gardening maps online, you can simply enter your zip code in order to have a guide on how cold it gets where you live. There are websites and apps, like The National Gardening Association’s, that offer garden calendar planting guides according to your city, state, or zip code. These sites offer downloadable and printable calendar guides which include your location’s average frost-free seasons, along with suggestions on which plants are best to grow during those times. 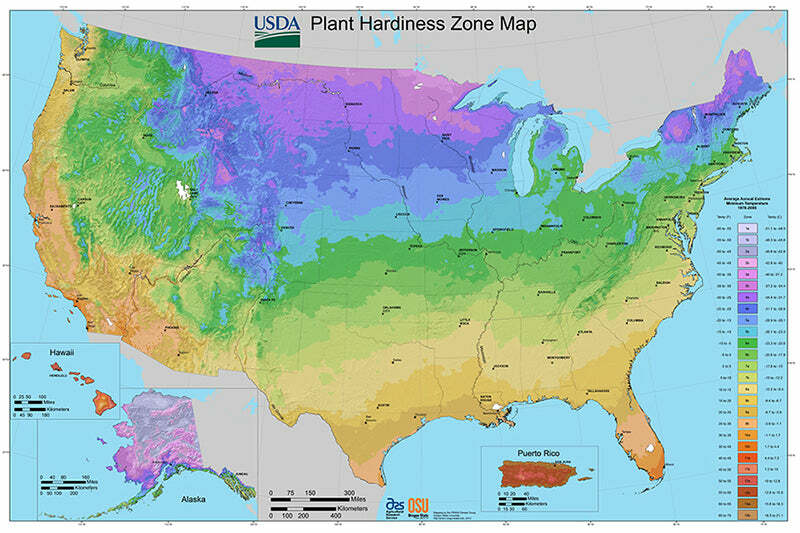 Remember that many perennial plants (including herbs and flowers) are considered hardy enough to withstand most cold winters in certain places, like the pink to purple zones in the USDA map above. However, it helps to narrow down the frost zones according to your exact location to really ensure a good harvest or a thriving garden. Here’s a surprising gardening zip code trivia: While interior Alaska may be considered chilly and unfriendly to plants by most gardening standards, the state’s passage going to Anchorage has been known to produce some brightly colored, healthy flowers (thanks to its abundance of rain and sunshine - but no scorching summers!). Many gardeners believe the same formula will likely yield good produce in the area, as well. Plenty of vegetables, plants, and flowers can tolerate (or even thrive in) a bit of frost. They usually grow better in the fall, and can be found in yellow-green zone up to the yellow through to the ochre zones southward. For spring, you can start seeding veggies like cauliflower, cabbage, lettuce, spinach, and broccoli as early as February - as long as you do so indoors. Chances are, the frost will make the soil hard to work with during this time. As soon as March rolls around, you can start transplanting your seeds outdoors. Refer to your gardening calendar app for specific vegetables and plants whose hardiness you aren’t entirely sure about. When autumn approaches, it’s a good idea to count a hundred days from your harvest date so you’ll know when to seed and transplant vegetables. Seed packets usually indicate harvest dates, so let those guide you. Garlic can be planted in the second week of September, but it’s best to use a soil thermometer to be sure. Soil temperature at 60° is ideal for planting garlic, at a depth of around 4 inches. Fertile soil trumps many other gardening issues, with some gardeners swearing by the “toss a seed, expect a fruit” method of casual gardening when they are blessed with rich soil. Unfortunately, not all places have this. If you aren’t sure about your soil fertility, get a soil test done to determine its sulfur rate and nutrient level. As previously mentioned, frost can render garden soil unworkable. The same holds true for drier regions. If you live in a part of the country where soil is alkaline, you will need to acidify it. You can add organic compost to your soil to neutralize its pH and make it more nutritious for plants. Pine needles have good acidity, so save some from your discarded Christmas tree in time for spring gardening. As a rule of (green) thumb, mulching in general can keep soil healthy, weed-free, and protected from extreme weather changes. Because of climate upheavals, there are longer periods of drought and frost which could render a climate zone map unreliable (or at the very least, unpredictable). The map above estimates the first date of frost in the fall and the last date of frost in spring in every region. While many gardening almanacs give an estimate on when the ground for every region would be soft enough to work with, the best recourse is still to test it on your own using a soil thermometer. Of course, observing your plants for any sign of drought stress or frost means you have to customize your watering schedule specifically around it. Knowing the types of plants and their developmental stages can also help you reduce watering in increments. For instance, squash, melons, cucumbers, and other vine crops only need ample watering during their flowering and fruiting stages. Peppers, tomatoes, and eggplants do not need a lot of watering as they love the heat, and tend to bear more fruit in warmer weather. With droughts come concerns of water shortage and how not to waste it. Garden soil needs mulch so water doesn’t evaporate as quickly in very hot weather. Two to three inches of mulch can act as protective layer from weeds and pests, while allowing water and fertilizer to seep through and stay in the soil and roots where they’re needed. It also prevents the sun from baking the soil underneath. Climate change has a huge impact on our seasons. This has never been more apparent than in the last few years, when drought and flooding have been wreaking havoc on crops and gardens in quick succession. Other variables come into play with huge environmental changes. Seasonal vegetables, plants, and flowers can refuse to grow within their expected “seasons”, while pests, weeds, fungi, and other gardening nemesis can pop up without warning during prolonged summers. Some practical suggestions in anticipation of wildly-changing weather and fluctuating temperatures would be to consider rooftop gardening, and seeking out drought-resistant produce. To start with, you can go for okra, peppers, collard greens, kale, spinach, Swiss chard, legumes like chickpea, lima beans and cow beans, mature rhubarb, chiles, cantaloupe, and herbs such as rosemary, sage, oregano, thyme, and lavender. In a drought, it’s no longer practical to plant in rows. It makes better sense to do block and grouped planting. The logic behind this is that the plants provide much-needed shade and nutrients for each other without competing for moisture and nourishment. A water-efficient garden layout can have blocks of similar-needs produce like cucumbers, squash, and zucchini - these vegetables require the same amount of watering. It may be tempting to add some cauliflower or broccoli into the mix, but as they need more room and are thirsty plants, they will create a problem with watering and nourishment. If you really want to conserve water by not using sprinklers or a garden hose, harvest rainwater or collect water left over from boiling vegetables instead. Not only are you recycling a much-needed resource, you’re also introducing added nutrients to nourish your growing plants. If you want a really rough guide on how to grow plants in your area, here’s a quick-reference chart listing all the states with their growing seasons, average number of frost-free days, and plants that are ideal for gardening at specific times.